Interested in Consigning? Contact us via email or facebook. Once you receive your confirmation e-mail from us including your consignor number. You set the price for the items you sell. You tag each item with that price. You bring your items to the sale on the designated "drop-off" date the week of the sale. You get one pass to shop during the Consignor sale along with 2 guest passes for a special shopping day . You pick up any unsold items after the sale ends on designated "pick-up" date & time (or they become property of R&R Consignment). We collect the tags for your sold items, tally the total, and mail you a check for your consignor percentage(70% of sales less consignor fee.) It's that easy! We charge an $10 consignor fee, and also accept tags from all other sales. You must email us in advance to let us know what consignor number you will be using and there can only be one number per consignor. Children’s books, DVDs, and computer games. Computer games should be made within the last 2-3 years to ensure compatibility with current computers. Baby equipment: Strollers, changing tables, exersaucers, slings, etc.. Note: We can no longer take cribs due to the new CPSIA law. We will also accept Thomas trains and toys, and also Hot Wheels cars! Is there anything that cannot be accepted at the sale? Stained, torn or out of date items will be pulled from the sales floor and DONATED ! Clothing must be clean, free from odors, tears & stains, and in excellent used condition. If you take a minute to steam or press your clothes, it will increase their desirability for shoppers. Hang all clothing on a hanger. The hanger needs to face left so it looks like a question mark (?) as shown here. All clothing must be hung on a hanger to be accepted at the sale. Pants/shorts/skirts need to be safety pinned to a hanger if you are not using a clip type hanger. Make sure that any shoes for sale are lightly worn and clean. Shoes may be tied together with string, shoelaces tied together, held fast with safety pins or, if it won’t hurt the shoes, held together with clear packing tape. Shoes may also be put in a clear plastic Ziploc bag. Please do not put in shoe boxes. Shoe bottoms must be scrubbed (no one buys dirty shoes!). Also do not leave shoelaces loose. Either tie the shoelaces together or place the shoes and laces inside a clear plastic Ziploc bag. Maximum of 3 pairs of shoes per consignor. Accessories and smaller items sell best as a lot (hair accesories, onesies, socks, etc.). Package these items as a group of 3 or more in a clear plastic Ziploc bag. Be sure to tape or pin a price tag to the bag that has a description. DVDs, and computer games must have original cases and packaging. Books must not be torn or written on. If putting tape on a book will damage it, please package the book inside a Ziploc bag. As a consignor, you are responsible for checking for item recalls. You will be asked to sign a waiver stating that no item in your lot is on a recall list. Check through the website at www.cpsc.gov for current recall info. For any items that need assembly, please come to the drop off prepared to assemble them with your own tools and with printed instructions on how to disassemble the item (so that the buyer can take it home). All toys must be clean and in working order. Any batteries must be installed so that buyers can see that the toy works. Please Ziploc small parts and attach the Ziploc to the biggest “part” of the toy item (if there are drawers, doors or some other place to attach them inside the item, please do it that way). On the inside of the Ziplock put a tag with your consignor number and with the description “1 of X parts” as the description (where X is the total number of pieces, including the Ziplock). If the item has other large parts, follow the directions given below for multiple-piece items (below - Pricing and tagging). Board games and other games should be taped closed. Puzzles, books, and small toys should be put in Ziploc bags with the tag facing outward. Then, tape the Ziploc closed with clear packing tape. Please also write your consignor number on the Ziploc with permanent marker just in case the bag is opened or tampered with. These are the most handled items at the sale, please package super duper securely! TOYS WHICH ARE NOT PACKAGED APPROPRIATELY WILL BE TURNED AWAY. Items will sell best when they look new. It’s worth your time to launder and press clothes, clean up baby equipment, and write prices and descriptions clearly on your tags. Remember to use 3X5 index cards for your tags. Standard paper is likely to rip off through normal shopping activity, and so paper tags will not be accepted. What about items that do not sell? You may pick them up after the sale. .
All items that are not picked up during the scheduled pickup time will become property of R&R Consignment and will be donated to a local charity of our choosing. As a consignor, you set the price on all items that you are selling. Remember that bargain hunters are looking for good deals, so be reasonable with your pricing. A good asking price is normally about 1/3 of the retail price for the item. Items must be priced starting at $4 and in $1 increments thereafter. All items go half price during the last day of the sale. This gives you a second chance to sell items that you'd be donating anyway. If you do not want your items to go half price, you must put ND on the tag (please use red pen or marker if possible). Be sure to write you consignor number in the appropriate space on each label. Write each item's price at bottom right-hand side of its label. Forgetting to price items is one of the most common oversights. We reserve the right to price items that do not have a price on the tag. 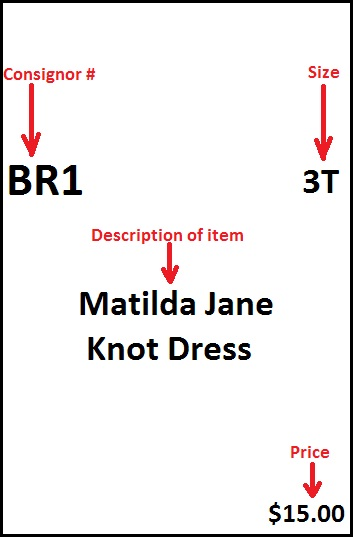 In center of each tag give a brief description of the item. Note the gender of the item in this space also. This is very important. If your tag accidentally gets removed from an item we may be able to locate the item because of the tag description. In the size area, please write the most exact size. Use 3-6 months, 4T, etc. Labels with prices or consignor numbers marked through will not be accepted. This is for security reasons. If you need to change a price please make a new tag. Safety pin your tag to your clothing item. Only secure your tag to the item, not to the hanger, or to any packaging. We ask that you attach your tags to clothing on the right front side (when the item is facing you, see example below) or to the item’s neck tag. For toys, books, DVD's, baby equipment, etc., tape price tags with clear packing tape so that they are clearly visible. Don't be afraid to use a lot of tape–these items get handled a lot! Multi-piece item tagging instructions: For non-hanging items (such as a multi-piece bedding set) with multiple separate pieces, put a tag on EACH piece. In the description section, write "1 of X" where X is the number of pieces. Complete each tag with consignor #, description, and "2 of X", "3 of X", etc. But DO NOT write the price on any tag except the first! 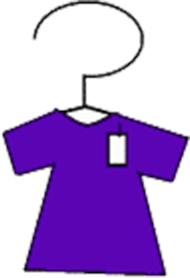 Hanging items with several pieces (such as an “outfit” of clothes) should be pinned to the same hanger or if on separate hangers, they should be rubber banded together. But use only ONE tag. Proper tagging is very important. Items with missing tags cannot be sold and will be added to the charity donation at the end of the sale. So be sure to attach all tags super securely. If a customer wants to purchase your item but the tag has come off we still cannot sell it. Tags that do not have a consignor number on them will be sold and the proceeds will go to charity. Be sure to put your consignor number clearly on each tag. As always if you have any questions please don't hesitate to contact us. We will be more than happy to answer any questions. Thank you for consigning with us! !